Did you know that there were 178 billion apps downloaded in 2017? App downloads have only increased since then, and expect to be up over 45% in the next three years. If your business doesn’t have a mobile app, now is time to jump on the wagon! Mobile development trends change from year to year as new technology is released. Staying on top of these trends allows your business to make a great app! Let’s take a look at the biggest mobile app trends for this year, and how apps help your company tap a new audience of people. How many apps have you downloaded, only to delete them after finding out they were lame? Businesses that create an app to fit the status quo are doing it wrong. Companies need to invest time and money into researching which mobile app trends are successful, before deploying an app and having it fail. Developing a mobile app with the latest technology trends, responsive tech support, and a team of dedicated developers helps to ensure your app’s success. Keeping up with the trends will make your app the next one people want to download. With the rise of artificial intelligence in marketing, apps are getting smarter and smarter every day. They are learning more about what users like and dislike, how people communicate best, and how to keep short attention spans interested. AI makes it easy for budget-conscious businesses to partake in app development, refinement, and tech support. It uses less manpower to run as it learns about your users every day and knows how to respond to them. With the onset of digital assistants like Alexa, Cortana, and Siri – customer support is becoming more user-centric. These virtual technologies hear users’ questions and respond to them as a human would. Adding those into a mobile app allow the user to have a better experience. Instead of spending hours searching for an answer in a forum, they chat the virtual assistant. Machine learning allows virtual assistants to learn more about a user, refining and customizing the way they interact and speak with them. Wearable apps live because of the Internet of Things (IoT), integrating everyday items with the internet. This makes your non-IT items able to sync and update with the internet. This means your things won’t go out of style or become outdated! As of 2016, there were over 526 million wearable devices connected across the globe. Pairing your mobile apps with wearable devices is a great way to have users thinking about your brand on a daily basis. Wearables are one of the biggest trends this year and expect to continue growing over the next few years. If you’re a business in the technology or fitness space, wearables are a great way to reach your audience. Smart watches are like mini computers, logging your fitness statistics and enabling you to call someone without having your phone. You’ll have to be a little more creative if you’re outside of the fitness space, but unique items that people are able to track digitally are becoming popular. AR and VR are another popular trending item among the mobile app development and gaming community. AR and VR make it possible for people to experience a digital world around them in 3D, making it super realistic. We all witnessed the Pokemon Go game a couple of years ago. This game took the world around us and paired it with your smartphone. It enabled you to see beyond what was in front of you by adding characters into your real surroundings. This was the start of virtual reality. It started with the gaming industry, but it won’t end there. Engineering firms use virtual reality to display a mockup of an actual building. The user can then walk through the building and experience it through VR goggles. They can look in all directions to understand what the space would feel and look like. This trend is beginning to take over spaces such as fitness and fashion as well. The use of VR and AR in apps allow people to create ideas in a digital world to visualize them better. Apps allow users to arrange furniture in their homes, try on clothes, or workout with a trainer. The integration of VR into mobile apps is cutting-edge technology and will place businesses ahead of their competition. An important trend for mobile app development is ensuring it’s safe and secure. With the onslaught of cybersecurity attacks and hackers stealing user’s personal information, mobile app security is key. Cybersecurity is one of the aspects of mobile apps that needs to update and refine over time. As hackers create more intelligent hacking algorithms and learn how certain apps security platform functions, the need for more complex security increases. This cybersecurity doesn’t protect on a personal level anymore. More and more users are now bringing their devices to work and loading work apps onto their smartphones. It isn’t enough to have desktop security for workplace apps. That security needs to translate to the mobile app as well. Hackers access enterprise data from smartphones and mobile apps if they lack proper security standards. If an app includes financial transactions, this security is heightened even more and requires secured API, encryptions, and trusted payments sources and sites. Blockchain technology relates to using payments on apps, but specifically for bitcoin payments. The bitcoin wouldn’t exist without blockchain, which is a permanent ledger hosting transactional information that cannot be altered in any way. It makes it impossible to break or change code without changing the entire code. It’s super secure and hackers stay away from it for the most part as it can’t be tampered with. While it is semi-controversial and not a federal form of payment, some mobile apps are allowing users to pay using blockchain technology and bitcoin. This creates a safe place for the user to make a financial transaction and be assured it won’t get intercepted. Ever tried to download an app for your Android to find out it’s only for iOs or vice versa? When a developer only creates an app for one platform, they are missing out on millions of users. It’s becoming more of a trend in 2019 to create an app that works across both platforms without any glitches. Developers know that in order to retain good customers, they have to cater to their needs. Losing half of your target market is not the way to go, so developers learn how to create apps for both platforms. Google released an awesome new feature in 2016 that allows users and developers to access an app prior to downloading. They can test how it works and jump in to see its functions and features as a trial. If they like the app after playing in the Instant app version, they download it permanently. Though few mobile apps are in the Instant app store, this is a convenient feature for users who are on the fence about your app. Google is continuing to update the number of Instant apps that appear in the store day-to-day. AMP is one of the greatest things to hit websites. It decreases loading time and brings you the internet at lightning speed. There are talks that soon Google will introduce AMP to its mobile app. Through the Google search box on mobile, Google populates AMP websites. The one caveat is that your website has to have AMP enabled to appear in Google’s mobile search box. Once Google perfects its development of this feature, mobile apps will be able to start using it as well. As technology gets better and smarter, mobile apps do too. The mobile app trends you saw above are great trends to use when developing a mobile app. If you don’t have an app and are in the planning stages, think about how to incorporate these trends. Your app won’t be perfect right away and your developer can make adjustments and improvements along the way. 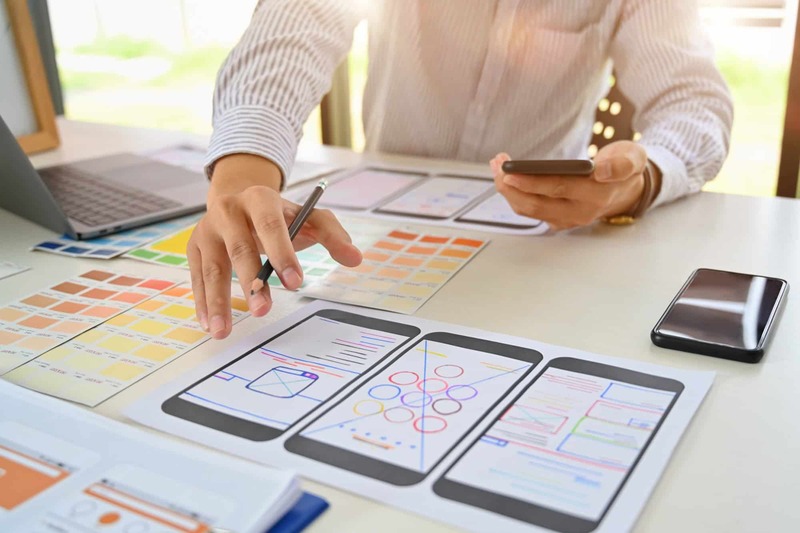 Getting a mobile app for your business is the best way to tap into the market of people that are using apps to make their life easier, and tasks more convenient. If you’re interested in learning more about how to make an app for your business or need help in getting started, contact us today!